Depends on the Organ that beholds it. As for labor, “the hard wiry line of rectitude and certainty in the actions and intentions”** of Blake teaches one to dispel hope—and fear — that great art is “the fruit of facility.” In a letter, the property of Mr. W. A. White, written to James Linnell on August*** 25th, 1827, he says, “I am too much attached to Dante to think much of anything else. I have proved the six plates and reduced the Fighting devils ready for the copper. I count myself sufficiently paid if I live as I now do and only fear that I may be unlucky to my friends and especially that I may be so to you.” He could “see,” and could work—his home being not the age nor the house in which he lived, but his mind. The placing of a stone near the site of his grave in Bunhill Fields, and of a tablet to his memory in St Paul’s, is rightly commemorative, as are reproductions and exhibitions of his works. In being urged to prepare for the Blake centenary, however, we are a little at a loss. If we are not already prepared, it is difficult to know how we are to become so. The old fairy was a good deal mortified at her husband’s want of gallantry, though she was reluctantly obliged to comply; the day was therefore spent in the most polite amusement, the gentlemen talked, the ladies laughed, and were angry. At last the happy night drew near; the blue cat still stuck by the side of its master, and even followed him to the bridal apartment. Barbacela entered the chamber, wearing a train fifteen yards long, supported by porcupines, and all over beset with jewels, which served to render her more detestable. She was just stepping into bed to the prince, forgetting her promise, when he insisted on seeing her in the shape of a mouse. She had promised, and no fairy can break her word; wherefore, assuming the figure of the most beautiful mouse in the world, she skipped and played about with an infinity of amusement. With respect to the vision of the Ghost of the Flea, seen by Blake, it agrees in countenance with one class of people under Gemini, which sign is the significator of the Flea; whose brown colour is appropriate to the colour of the eyes in some full-toned Gemini persons. And the neatness, elasticity, and tenseness of the Flea are significant of the elegant dancing and fencing sign Gemini. This spirit visited his imagination in such a figure as he never anticipated in an insect. 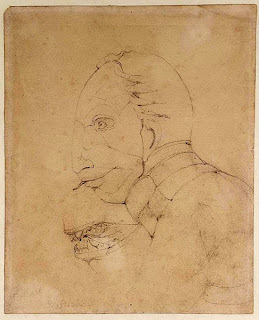 As I was anxious to make the most correct investigation in my power, of the truth of these visions, on hearing of this spiritual apparition of a Flea, I asked him if he could draw for me the resemblance of what he saw: he instantly said, ‘I see him now before me.’ I therefore gave him paper and a pencil, with which he drew the portrait . . . 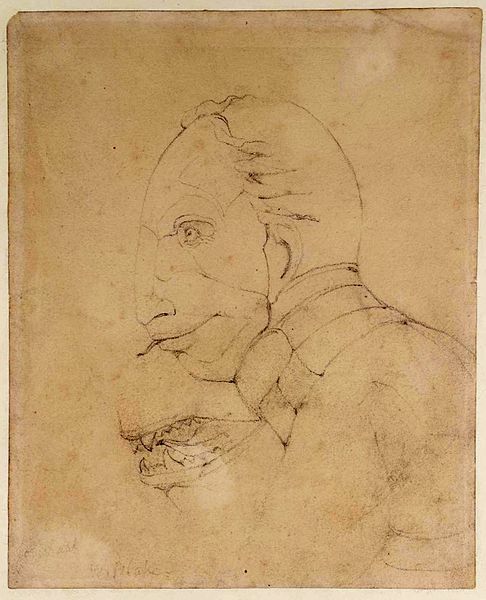 I felt convinced by his mode of proceeding that he had a real image before him, for he left off, and began on another part of the paper to make a separate drawing of the mouth of the Flea, which the spirit having opened, he was prevented from proceeding with the first sketch, till he had closed it. The great and golden rule of art, as well as of life, is this: That the more distinct, sharp, and wirey the bounding line, the more perfect the work of art; and the less keen and sharp, the greater is the evidence of weak imitation, plagiarism, and bungling. Great inventors, in all ages, knew this . . . The want of this determinate and bounding form evidences the want of idea in the artist’s mind, and the pretence of the plagiary in all its branches. How do we distinguish the oak from the beech, the horse from the ox, but by the bounding outline? How do we distinguish one face or countenance from another, but by the bounding line and its infinite inflexions and movements? What is it that builds a house and plants a garden, but the definite and determinate? What is it that distinguishes honesty from knavery, but the hard and wirey line of rectitude and certainty in the actions and intentions. Leave out this line and you leave out life itself; all is chaos again, and the line of the almighty must be drawn out upon it before man or beast can exist. *** Likely Moore’s error. The letter (“I go on without daring to count on Futurity. which I cannot do without Doubt & Fear that ruins Activity & are the greatest hurt to an Artist such as I am . . .”) is dated April 25, 1827. Blake died August 12, 1827.